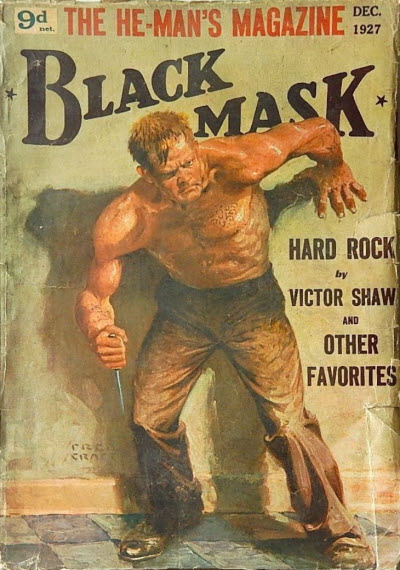 Title changed from The Black Mask (UK). Several other issues (as yet unidentified) are believed to exist. Reprint of the May 1927 (US) issue, plus a single story from elsewhere. Reprint of the June 1927 (US) issue, plus a single story from the October 1920 (US) issue. Reprint of the July 1927 (US) issue, plus a single story from the April 1920 (US) issue. Reprint of the August 1927 (US) issue, plus a single story from the September 1920 (US) issue. Reprint of the September 1927 (US) issue, plus a single story from the June 1920 (US) issue. Reprint of the October 1927 (US) issue, plus a single story from the July 1920 (US) issue. Reprint of the November 1927 (US) issue, plus a single story from the July 1920 (US) issue. Reprint of the December 1927 (US) issue, plus a single story from the May 1920 (US) issue. Reprint of the January 1928 (US) issue, plus a single story from the May 1920 (US) issue. Reprint of the February 1928 (US) issue, plus a single story from the May 1920 (US) issue. Details supplied by John Benson. Reprint of the March 1928 (US) issue, plus a single story from the July 1920 (US) issue. Details supplied by John Benson. Reprint of the April 1928 (US) issue, plus a single story from the May 1920 (US) issue. 2 · In the Light of the Red Lamp · Maurice Level; translated by Alys Eyre Macklin · ss 1909, as The Grip of Fear; translated from the French (Sous la lumière rouge, Le Journal, 1906). Reprint of the May 1928 (US) issue, plus a single story from the May 1920 (US) issue. Partial reprint of the June 1928 (US) issue, plus two stories from the July 1920 (US) issue. Details supplied by Mike Whale.